When you add a shift and do not manually enter the shift “paid hours” (duration), it is “auto calculated” – meaning that the paid hours for that shift are set to be the exact time between the start and end time. For example, 8am to 5pm would be auto calculated to be 9 paid hours. Sometimes if there is unpaid break time between when employees come in and leave (ex. an unpaid break or lunch) you will want to manually enter that shift’s paid hours. The Auto Calculate check box is defaulted to On, but if you enter a number, it will not be automatically calculated. You can manually add in the paid hours when you add a shift, or later you can do this quickly for a number of shifts or view how the shifts are all set using the Multi-Shift Edit schedule view or the Grid View using Bulk Edit. On the Multi-Shift Edit schedule view Multi-Shift Edit view, if you see “ac” next to the paid hours, this means that it was automatically calculated. 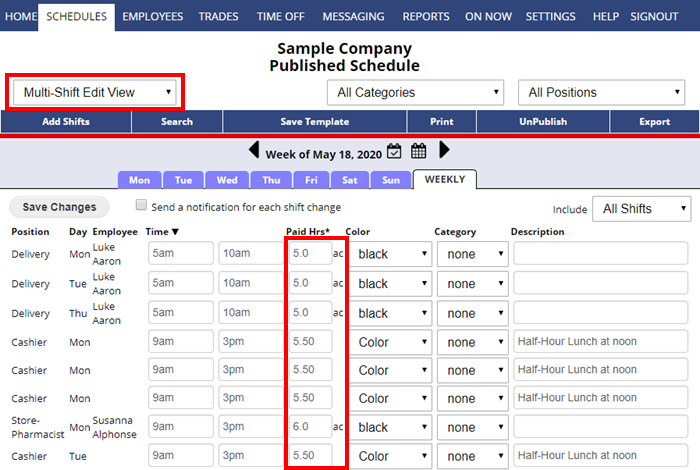 You can quickly view this information and make changes to a number of shifts’ paid hours on this view and then click the Save Changes button. When you set your shifts’ paid hours (duration), and in future weeks you Import that schedule or Saved Template, all of the shifts will already be set to the correct paid hours. You only need do this once for your initial schedule week. You can quickly add this information to multiple shifts using the Multi-Shift Edit schedule view or the Shift Grid view.